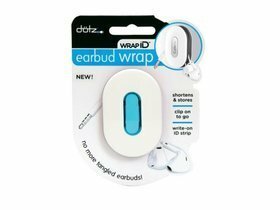 Wrap to shorten earbud cords for tangle-free listening and storage. Flexible rubber conforms to most earbud cord shapes and lengths, including earbuds with microphones. Built-in clip fits on pocket, bag, strap or shirt to secure and go. Earbuds not included. Built-in clip fits on pocket, bag, strap or shirt to secure and go.